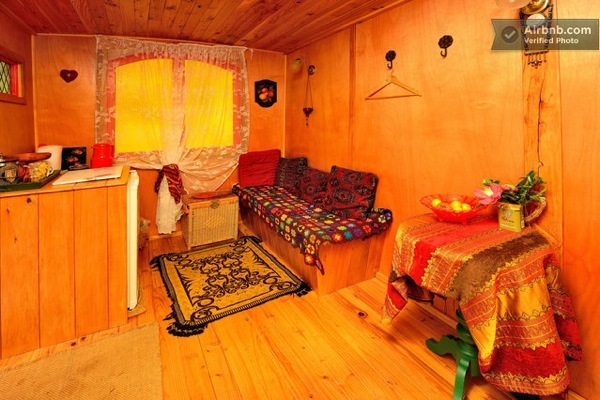 This gypsy caravan isn’t really completely set up for full time living. At least not for me. But it does offer you a queen bed, mini-fridge, tea & coffee and separate bathroom/toilet. I think it’s great as a micro guesthouse or cabin to have in the backyard of your current home. It can also double as a getaway. At home away from home sort of thing. If I wanted to make it a little more permanent I’d probably build another one right beside it to use as the shower, bathroom and kitchen facilities. Then one more as a really tiny office space where I can work, write, read and study. How about you? More info and photos of this romantic gypsy caravan getaway in New Zealand right here. If you enjoyed this micro caravan express it with a “Like” below then share what you liked most about it in the comments at the bottom and join our free daily tiny house newsletter if you want more!